Blow me down, it's Feather Stitch! 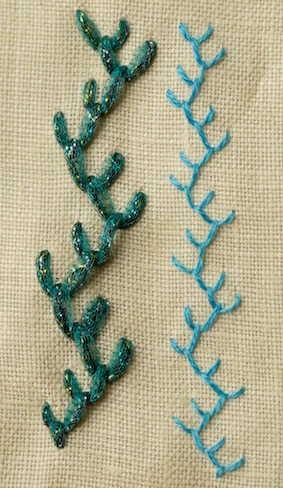 Feather stitch is sure to become one of your go-to stitches as you adventure into hand embroidery. It is attractive and easy to sew. Whether you work it in a straight line or in more naturalistic curves, it gives a delicate effect. Used by itself it can represent branches, twigs, vines, or stems in a floral project. You can also create underwater scenes by using it for seaweed, coral or starfish. 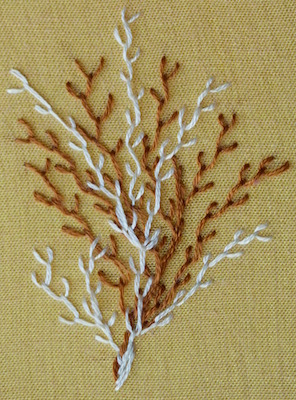 In fact, another name for this stitch is single coral stitch.. Think of a twig, and you will be starting at the tip and working towards the main stem or trunk. You can work this stitch either with the fabric held taught in a hoop or loose "in the hand". When working without a hoop you can scoop up the fabric as shown by the needle in the diagram. If you prefer to use a hoop, then you will need to "stab stitch" by putting the needle down and bringing it back up in two separate steps. The thread needs to lay under the needle in a loop before pulling it all the way through the fabric. This method of working is demonstrated in my two videos below. I often find it easier to watch a stitch being worked rather than trying to follow a written description, I don't know about you?. 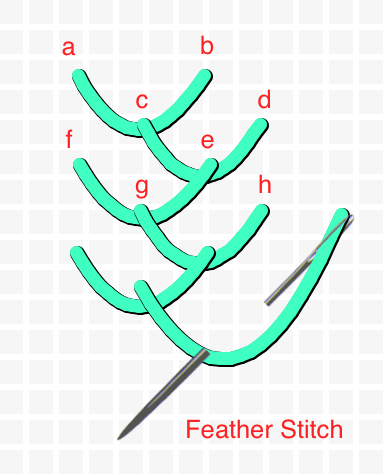 So where will you find feather stitch used? It often features on crazy quilt blocks,, decorating the seams between patches, as in the photograph below.. Occasionally, feather stitch was used to join together quilt blocks embroidered with redwork designs.. 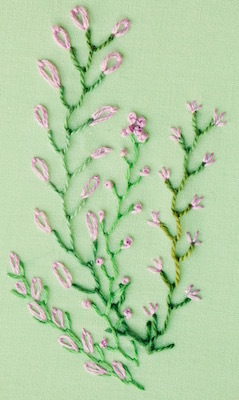 In times gone by, English farmers wore smocks which were decorated with this stitch, in a technique known as Dorset Feather Stitchery. There are lots of ways the basic stitch can be varied. 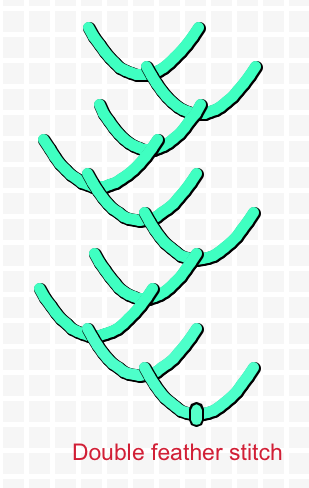 You can work more than one stitch on each side before moving across to the other, producing double and triple variations. 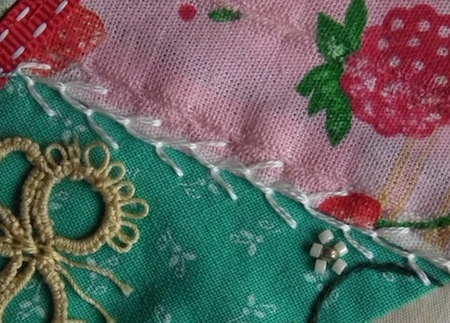 In the photograph below you can see the stitch worked at different scales . The chunkier sample uses Splendor Frosty Rays, which is a sparkly ribbon. I used Splendor Strandable 12-ply silk for the finer sampler. To make it easier to understand I used a checked fabric in the video below. However, there is no need to be this exact in lining up your stitches when working on your own projects. Have fun, and experiment to see what effects you can get. You never know, soon feather stitch might become one of your favorites too!